Mammoth Spring is a scant 497 feet into Arkansas. Interesting Information: Mammoth Spring, in downtown Mammoth Spring Arkansas, is only 500 feet south of the state line, and a section line bisects it in both directions. At one time, four different owners claimed a part of the spring pool. Major landscaping has been done at the site, including the effects of a high dam downstream on the spring branch used at various times for milling, ginning and electrical production. Brief History: Mammoth Spring was discovered early, because when David Dale Owen, first Arkansas state geologist, passed by in 1850, the spring already had been used for milling for 14 years, starting in 1836. Local boom during the 1880s featured the spring as a major attraction, enabling the consolidation of spring ownership. 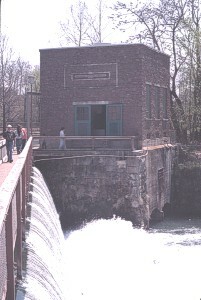 Used primarily as scenic attraction and power site, milling continued until at least 1944, and power generation until 1972. The spring is the site of a federal fish hatchery, and became an Arkansas state park in 1957. Ownership and Access: Mammoth Spring is an Arkansas state park. No camping is permitted, but picnicking and other recreation is allowed. No charge to view the spring. Old power plant next to the Mammoth dam.